If a group of wine enthusiasts from Planet Zog were to show up in any of our local supermarkets, they could be forgiven for drawing the conclusion that the only two white wines on our small world are Chardonnay and Sauvignon Blanc. Honestly, there seems to be little else on the shelves. How often do you see wines made from grapes like Riesling, Chenin Blanc, Viognier or Gewürztraminer, let alone all the other white wine grapes? Not very often, it has to be said. Sad to say, there is an element of sameness in many Sauvignons, especially those from the southern hemisphere. 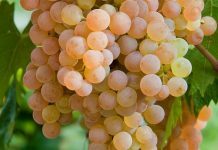 The grape probably gets its name from the French word sauvage (“wild”) yet too many modern Sauvignons have any wildness knocked out of them and sometimes they’re rather flat and dull. I must confess that as I was uncorking this bottle of South African Sauvignon Blanc I was thinking, “Here we go again.” But I was taken completely by surprise when a lovely fresh and lively aroma wafted out of the bottle. African legend has it that the “Bundu Star” was only bestowed upon a true leader and champion warrior. This wine is a young and zesty warrior, with its aromas of fresh oranges, melon and pineapple that almost leap out of the glass. When the bottle has been open for a bit, you might also pick up smells of grassy lime, with dry herbs somewhere in the background. The beautiful Breede River Valley, South Africa. After the beguiling gentle aroma, the taste of this light-gold wine really makes you sit up and take notice. It’s bright and lively, loaded with fruit flavours. There’s a crisp dash of spritzy acidity that not only holds the body together, but seems to add another dimension. The wine seems to squeal, “Wow! Look at me!” It really is a charmer and the most attractive Sauvignon Blanc I have come across in recent months. It’s dry as they come, but there’s a tantalizing hint of raisiny sweetness on the palate and a pleasing fruity dry finish too. This would make a superb apéritif, because it’s young, bright and vivacious and at only 12.5% alcohol just the thing to kick off a pleasant evening. You may be less familiar with the Pinotage (pee-noh-TAHJ) grape. 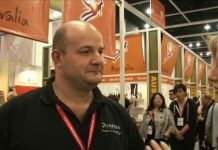 It’s a red wine grape that has become South Africa’s signature variety. 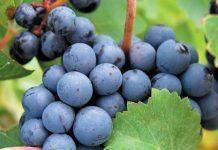 First bred in 1925, it’s a cross between the difficult-to-grow Pinot Noir and the more robust Cinsault grape (known as “Hermitage” in South Africa), hence the derived name of Pinotage. It didn’t really become popular until the 1960’s but it’s now also grown in several other countries including Brazil, Canada, Israel, New Zealand and the United States. Nevertheless, its spiritual home remains South Africa. I should mention perhaps that Coffee-Pinotage wine is not made by simply chucking a bucket of Starbucks into the wine barrel. The coffee and chocolate aroma and flavour come partly from a combination of grape ripeness, yeast type, and by “toasting” the oak staves of the barrels in which the wine will be aged. This BunduStar wine has a delicate, almost ethereal aroma of coffee – the kind of smell you get when you grind fresh coffee beans that have been grown high in the mountains. There’s also the aroma of rich dark fruits and berries, with subtle hints of chocolate and spicy vanilla. To be honest, I was expecting the wine to deliver the kind of taste that would bring down a horse, but this rich, ruby-coloured wine is amazingly soft and sophisticated. It has loads of plummy fruit on the palate and only the slightest hint of tannin. Actually, the tannin comes through a little more on the after-taste giving a lovely dry finish to each mouthful. If you love big, softy, fruity reds, do give this a try. It’s a real winner.